Trains…Trains..Trains…Leo is trains MAD. He loves them. Toy trains, model trains, steam trains, diesel trains, rides on trains, all trains! He simply LOVES trains. You only need to look at my iPad and have a mooch around my YouTube account to see that a certain 3 year old often steals it in order to watch trains on demand. He watches the footage that train watchers create, and he also likes to watch Thomas the Tank Engine. Yup, my boy loves Thomas and his adventures. 2015 see’s Thomas and Friends turning 70 years old, how incredible is that!? It has proven so popular that it has carried on being loved and adored all these years later, it would appear that kids seem to love trains! 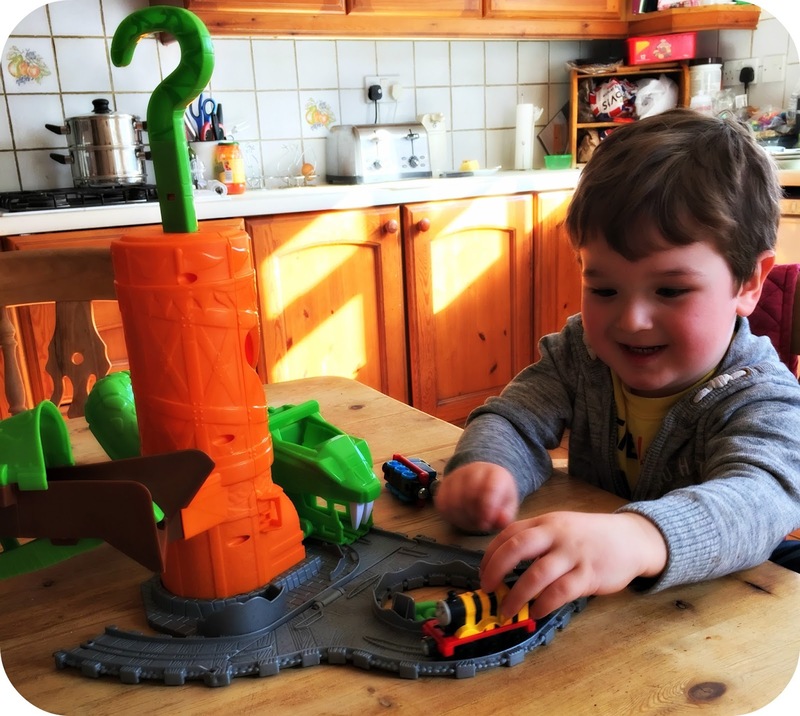 In celebration of Thomas’s age old birthday, Fisherprice kindly asked us if Leo would like to review the new Thomas and Friends Take-n-Play RattlingRailsss Playset, of course I didn’t need to ask Leo twice. He instantly accepted the play challenge and then set up camp by the door awaiting the post each day, in hope that his new track would arrive. Of course when it did we had to get it out right away and get it built up so that he could play with it instantly! Building train track is my downfall, I just cannot do it. I can’t follow instructions to save my life and I often find the pieces a little fiddly. Luckily Granny was on hand to help build the latest Take-n-Play set, and it wasn't long before Leo’s imagination was running away with him, and he had multiple trains lined up ready to hurtle around. 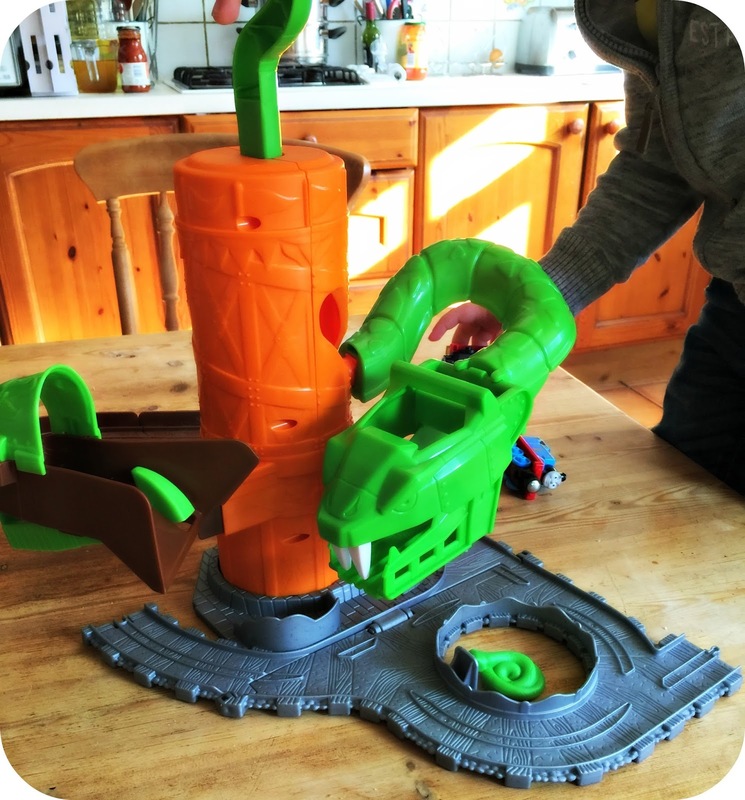 I have to admit even I was impressed by the Rattling Railsss Playset, it was hard not to be when the snake actually moves when you press the lever on the top of the set (this also acts as a very useful carry handle). 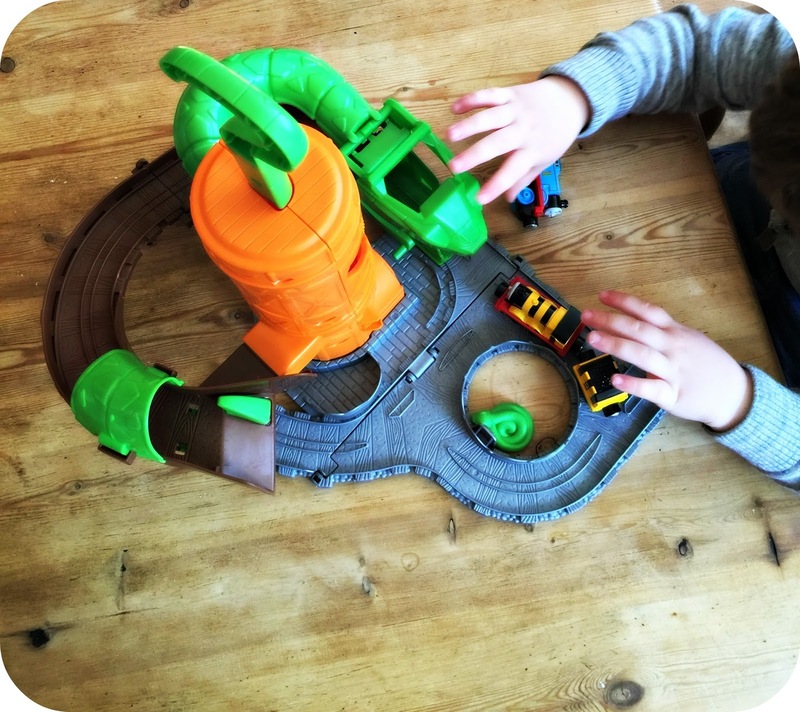 Leo was putting Thomas around the track, letting him stay stationary in the snakes mouth and then pushing the lever down to send him whizzing over to the other side of the track before starting the process again! The set comes with a diecast Thomas Train so that play can begin right away, there are no need for batteries, so once it’s built it is ready to rock and roll. This toy has been played with on a daily basis since its arrival, and with Leo’s rather impressive diecast Thomas collection, he is not short of trains to use with this set. I would recommend this for any Thomas fan, it is recommended for kids aged 3 and up and I would say that is a fair guideline to work to. I really like that the set is so portable, it makes it easy for Leo to carry around himself during game play, and tidying it up at the end of the day. Leo absolutely loves this set and gets so much enjoyment out of his play time. Of course I love that it can be stored away so readily at the end of play, Leo's train collection is booming and we certainly couldn't have them all on display all of the time. Leo's game play is so full of imagination and it's rather fascinating to watch, train crashes, casualties, ambulances speeding in to take the injured away, train races, and the crazed snake gulping up engines! There is never a dull moment when it comes to Leo's games. The Rattling Railsss Playset retails at £20.99, but is currently on offer at Amazon for £17.99 at the point of writing this review. 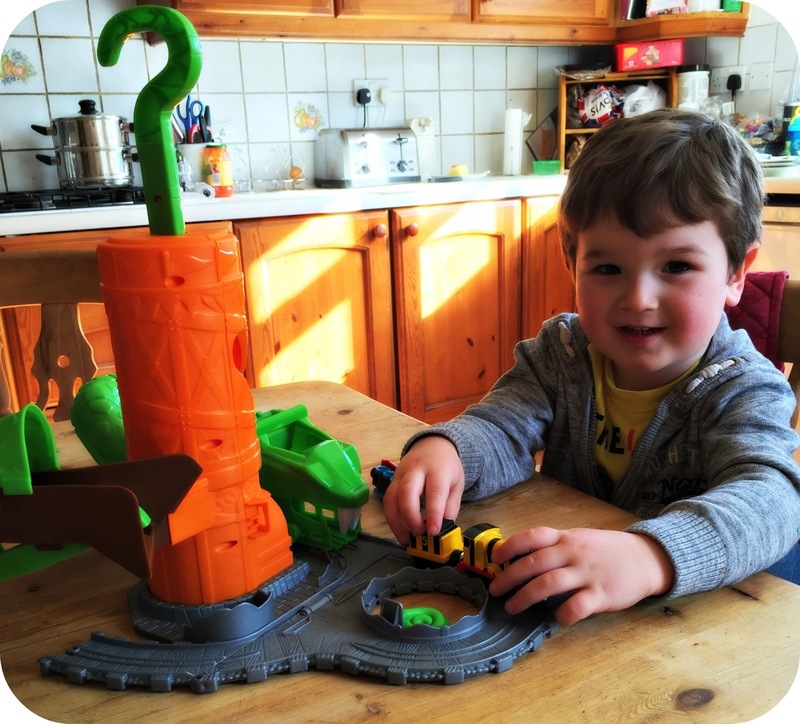 Disclaimer: We were sent the Rattling Railsss Playset for the purpose of this review. All views and opinions are completely honest and my own.